Click here to support our educational efforts now. Throughout North America wildlife management specialists and conservation/police officers respond to thousands of calls and complaints about wildlife, especially bears, snakes and alligators. Most of these problems are a direct result of wild animals obtaining food rewards throughout a community. Unfortunately, these animals are often destroyed in order to protect people and property. By establishing a wildlife stewardship campaign the whole community can cooperatively help reduce human/wildlife conflicts. Students youth groups, city and county agencies, and neighborhood groups can partner efforts to distribute educational and public awareness materials to visitors and new residents. Assemble a group of volunteers and prepare an assessment of wildlife hazards in your community and surrounding area. Work closely with your local wildlife management agency. Prepare a wildlife/human conflict management plan that addresses the wildlife hazards and land-use conflicts indentified in the previous step. Contact your local representatives. Ask them to implement "wildlife smart" bylaws prohibiting the provision of food to wildlife as a result of intent, neglect or irresponsible management of attractants, and to assist in planning new housing developments so that greenbelts don't channel wildlife into highly populated areas. Conduct a continuing wildlife education program directed at all sectors of the community, especially youth groups and students who can help conduct workshops and training programs among their peers. Clear brush away from playgrounds, schools and other areas where children actively play. Establish a community response system for notifying neighbors and authorities of wildlife in the community that may be dangerous. 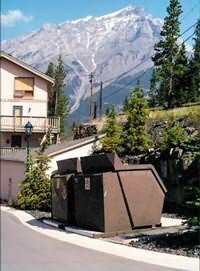 Develop and maintain a bear-resistant municipal solid waste management system. Design trash transfer centers so they are out in the open and visible by passing traffic. Remove all grass or brush from the area. Provide strong fencing that extends below the ground surface. Keep it clean of trash blowing around. Restaurants, packing houses and sources of very highly attractive garbage should also use bear-resistant dumpsters. Community Involvement: Residents working together to help each other. Minimize odors and the availability of food rewards through out your yard and neighborhood. Report all residential wildlife encounters to your local wildlife management agency and police department, and notify your neighbors of the situation. Remove any dense brush that could provide cover for a bear or cougar and make a surprise encounter likely. Also remove brush piles that snakes may hide in. If a bear or other wild animal repeatedly enters your yard, look for what attractants are drawing it there and remove them. Put out garbage on the day of pick up, not the night before. Store in a sturdy building or place in an approved bear-resistant trash receptacle. Do not leave pet food out. Hang bird feeders out of a bears reach and take down during periods of high bear activity. Keep bar-b-ques clean and grease free. Store with livestock/pet feed and other attractants inside a sturdy building. Fruit trees: Pick all ripe fruit from the tree and surrounding ground. Compost piles may attract wildlife, especially bears. Do not put meat, fish and other pungent scraps in compost piles. Add lime to reduce odors and accelerate decomposition. Electric fences are an effective way to keep bears and other animals out of orchards, gardens, compost piles and beehives. Follow appropriate safety precautions. Never feed wildlife. Feeding marmots and deer can attract cougars. Feeding chipmunks and ground squirrels can increase the possibility of hantavirus and rabies. Feeding ducks and fish can attract alligators. All wildlife can be dangerous. Do not attempt to chase or harass an animal out of your yard, especially if it is a bear or alligator. Contact the appropriate authority for assistance. Be sure to seal holes and spaces around your home to prevent insects, snakes and rodents from entry. 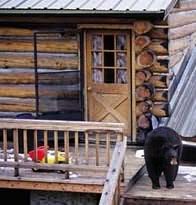 Bear activity may intensify in the spring when bears are hungry and emerging from their dens, in the fall when bears are bulking up for hibernation, and during drought periods. This is due to natural foods often being scarce. All information and images, Copyrighted 2012, Center for Wildlife Information. Web design copyright 2005-2008, Flathead Valley Web Works.